The Benchmark team of developers, builders and sales representatives are hands-on professionals who work closely with customers to integrate and simplify the home buying process and to deliver a product and lifestyle that lead to strong customer satisfaction. Benchmark Homes is a leader in offering distinctive and luxurious features and finishes that are in many cases beyond what customers expect for the price. The Masterpiece Collection of homes, introduced by Benchmark in 2006, features open, spacious floor plans, chef's kitchens, premium hardwood floors, granite countertops, arched openings, bench seats, mud rooms, multiple fireplaces, structured wiring, heavy custom trim, and beamed and coffered ceilings. Many also have kitchen offices, keeping rooms, groin and barrel vaults, elevators, full amenity owner's suites, three car garages, added terrace level living spaces, wine cellars and warm, inviting outdoor fireside living spaces.The Masterpiece Collection offers homes with Old World Normandy, French Country and Tudor exteriors of stone, brick and timber. Homes by Benchmark feature quality construction backed by Benchmark's Quality Assurance Program. With its extended, transferable 10-year structural warranty and 1-year builder's warranty, home owners have peace of mind about their investment and are assured of the high standard of excellence that Benchmark's "Customer Care Program" provides. Benchmark is committed to customer satisfaction through prompt, courteous service. Home buying, for most consumers, is their single largest investment, and Benchmark takes its responsibility seriously to deliver the best possible experience for all involved. Benchmark offers homes in a variety of price ranges in many of Atlanta's most desirable locations, including the popular Vinings area of Cobb County, where five neighborhoods are available. Many feature homes from the Masterpiece Collection, and residents enjoy low taxes in a location close to the heart of Atlanta. Benchmark also has neighborhoods in West Cobb near Marietta and Town Center, as well as close-in near I-285 and Atlanta Road in Vinings. Continuing its long-standing tradition of building the finest homes in the popular South Fulton area, Benchmark offers four communities along the I-285/Cascade Rd. corridor with easy access to Hartsfield-Jackson International Airport.Many of these homes also are from Benchmark's Masterpiece Collection and are on large one acre lots. Home owners in Benchmark's newest community in this area, Canaan Ridge at Wolf Creek,will enjoy a selection of golf course lots. Benchmark is building in three neighborhoods in fast growing Douglas County on I-20 West near Atlanta. Benchmark'newest community here is Prestley Park,which features homes from the Masterpiece Collection on large, wooded lots. Beautiful traditional homes also are available in Mount Vernon Point, a swim and tennis community priced from the $300's. Benchmark is raising the bar in Carroll County with Tanyard Village, located near historic Villa Rica and I-20 West. The community offers distinctively designed homes priced from the $200's. Benchmark has a proud history and one that truly has stood the test of time.This kind of stellar history has its advantages and allows Benchmark to bring a wealth of experience and proud tradition to each and every home Benchmark builds. Let Benchmark Homes define higher standard of value, quality and tradition in your next new home, creating "A Hallmark for Life," where fine, luxurious living comes naturally. Defining a Higher Standard of Value, Quality and Tradition Since 1971. Benchmark Homes has established craftsmanship, quality and superior design standards as the hallmark of its company's philosophy. When Benchmark Homes was founded in Atlanta in 1971 by Larry and Elizabeth "Liz" Boggs, it was rooted in traditional family values with the simple goal of constructing the highest quality homes and neighborhoods while establishing strong, lasting relationships with customers. 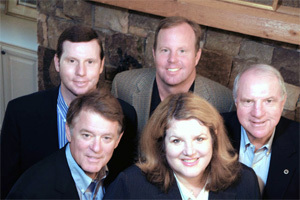 Those same values and sound business practices continue today in this family-run business as Larry and Liz's three adult children, Lisa, Kirk and Stephen, continue the Benchmark tradition of building the most beautiful homes in metro Atlanta.